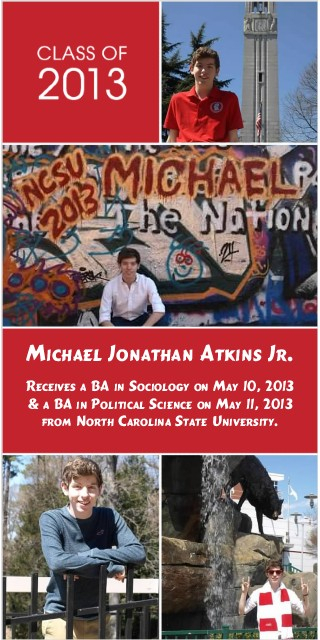 Congratulations to Air Force dependent Michael Atkins, Jr, who graduated from North Carolina State University with degrees in Sociology and Political Science. While at NC State, the Thomas Jefferson Scholar received consecutive ThanksUSA scholarships totaling $9,000. With his undergraduate studies complete, Michael is eagerly preparing for law school. Michael has remained actively involved with ThanksUSA throughout his college years. He was first introduced to ThanksUSA supporters in a Scholarship News feature during his freshman year. He represented ThanksUSA scholarship recipients at our 2010 Congressional Round Table and has written letters of thanks to individual donors. Most recently, Michael has been meeting with fellow ThanksUSA scholarship recipients to establish a ThanksUSA alumni group. ThanksUSA is just one of many charitable organizations that Michael contributes his time and energy to. He has made a lifetime commitment to community service and was even appointed to the North Carolina Commission for Volunteerism and Community Service at the age of 19. Please join the ThanksUSA team in congratulating Michael on his academic accomplishments and wishing him continued success with law school. Congratulations Michael! !